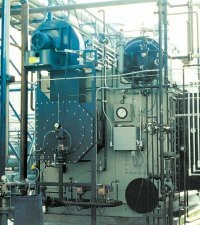 ALZETA® Corporation is a leader in commercial and industrial boiler burner technology. Our team of engineering experts stands behind our products, ensuring the burner element designed specifically for your application provides long lasting and high performance capabilities. When it comes to reliability, efficiency, and air quality control, you can trust the team at ALZETA. ALZETA burners are used in many industrial and commercial applications including boilers, water heaters, air heaters, furnaces, cooking equipment, steam boilers, firetube and watertube boilers, and paper manufacturing radiant heating. We work with OEMs, creating a flame shape and uniform heat for the burner element without damaging the system it’s designed for. When choosing a burner for your application, the following must be taken into consideration: heat flux, environment, filtration needed, durability, and fuel types. For help in choosing the right burner for your application, visit Find the Right Burner. This page helps you determine which system is right for your heating needs. Being the source of the burner element technology, all of our products are completely unique to our company. They require minimized capital and start-up costs and the design reduces maintenance and repair costs. The burners are made to withstand demanding industrial operating conditions and can be designed for indoor/outdoor use. Burners include ultra low NOx, low NOx, exhaust gas abatement systems, flameless, ceramic, high performance radiant burners, and high output metal surface burners. For more information on the industrial and commercial burners from ALZETA, visit our product literature. Or to speak with our engineering experts on securing a new burner element for your combustion system, contact us today. Our expert research and development in relation to combustion technology is unparalleled within our industry.